The last few weeks I played the final battle of the Death of Varantes mini-campaign twice. Once as the imperial guard defender of Varantis and once as it’s Necron nemesis. Both battles turned out to be a fun and fitting end of the mini campaigns and have given me inspiration for a continuation of the story line. My battle as a guard player against Ron’s Necron hordes was an uphill struggle. 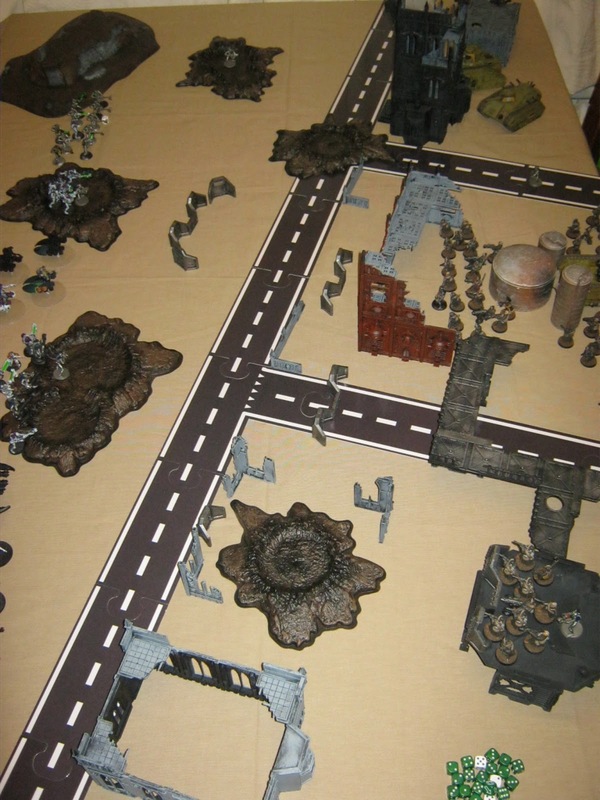 I had lost both skirmishes leading up to the big battle, so Ron had the advantage of choosing the scenario and selecting the nature of any objectives in his own deployment zone. 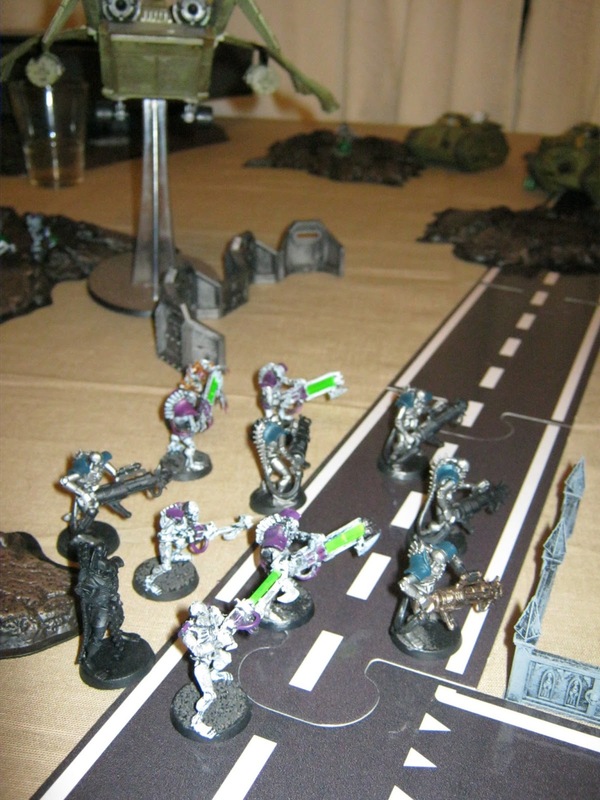 I used the Valhallan guard army featured in a number of my previous posts and build up around the patrol, fielded in the First mission. 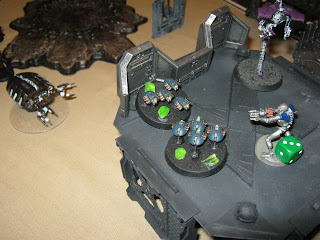 Ron expanded his force’s with some wraiths, a large unit of immortals, some scarabs and destroyers, all led by a Necron overlord joining the immortals. The table was nearly identical in both battles: a ;long road crossing the table marking the edge of the city ruins, with some craters and defence lines in no-man’s-land giving cover to the advancing alien menace. Ron picked the Scouring scenario; giving the objectives a random value and making fast attack units scoring. 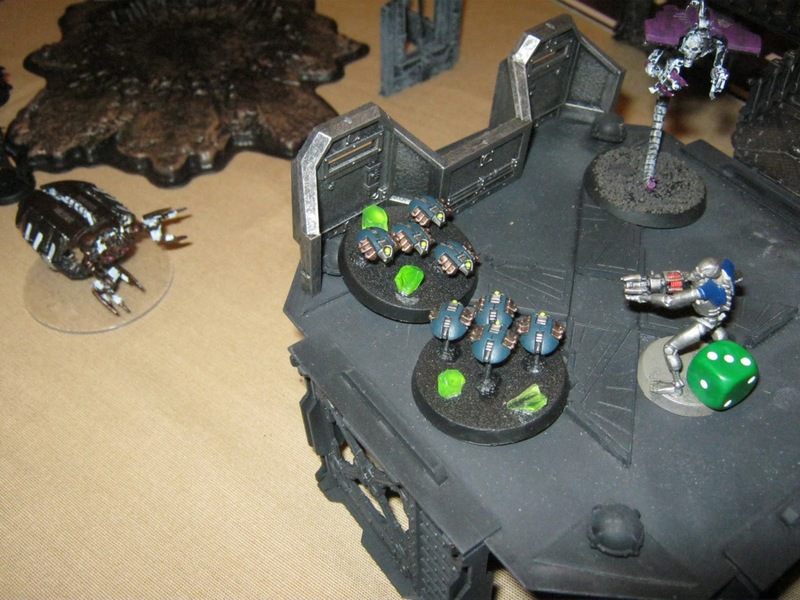 He got to deploy First, placing two of his troops on home objectives, selecting one to be a force field(increased cover) and the other a targeting matrix(rerolls to hit). His assault troops were gathered on his right flank were he could easily reach the cover of the city edge. 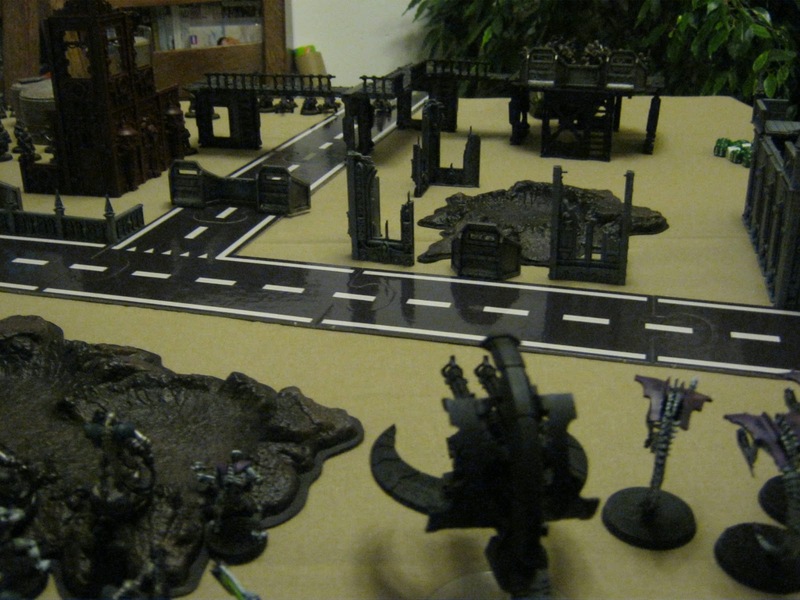 I deployed my units in the centre of the ruins, with most of my armour on the right flank, as far away from the fast attacking, armour stripping scarabs and wraiths as possible, and with their sights on the one remaining uncontested objective. 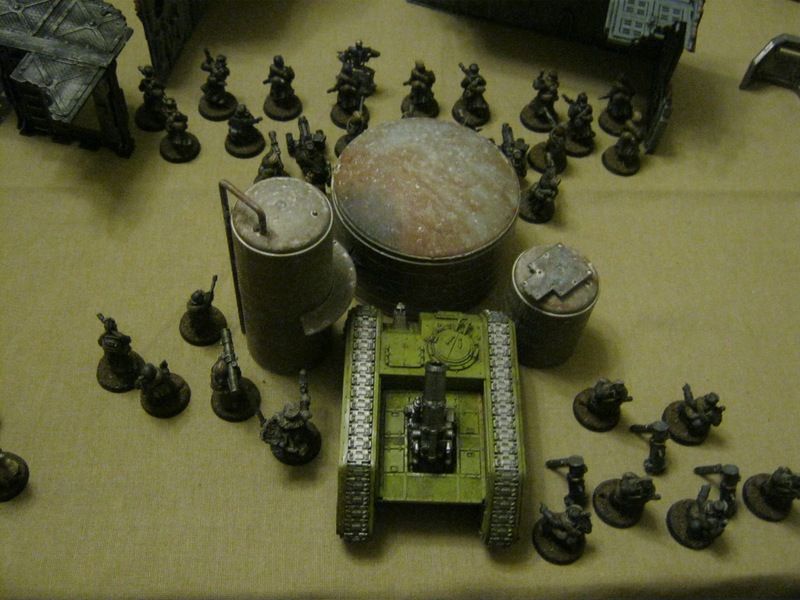 The battle began with Ron’s fast attack units advancing towards the objective(which turned out to be another force field) on my left flank, guarded by an infantry squad and a special weapon team equipped with a demo charge. 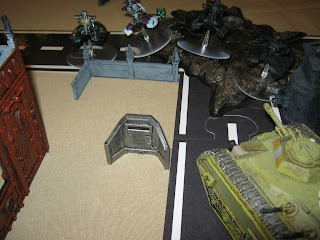 Ron’s units advanced into a withering hail of fire, but the surviving models managed to wipe out the Imperial guard defender to a man, a single phasing necron wraith the sole survivor of the battle. On the right flank my armoured units, supported by a mortar squad managed to stall the Necrons advancing towards the uncontested objective. The destroyers sallied forth to destroy my armour, but failed to notice the five brave roughriders hiding in the shadows of the arbitus precinct house, and where duly cut down by a glorious cavalry charge (Ron really had forgotten about them because he couldn’t see them from his side of the table). All in all the battle went pretty much above expectations for me. In Ron’s defence it must be said that he was suffering from one hell of a headache when he decided on the scenario, and some mistakes in army selection (no transports) and objective placement saw him fighting an uphill battle. 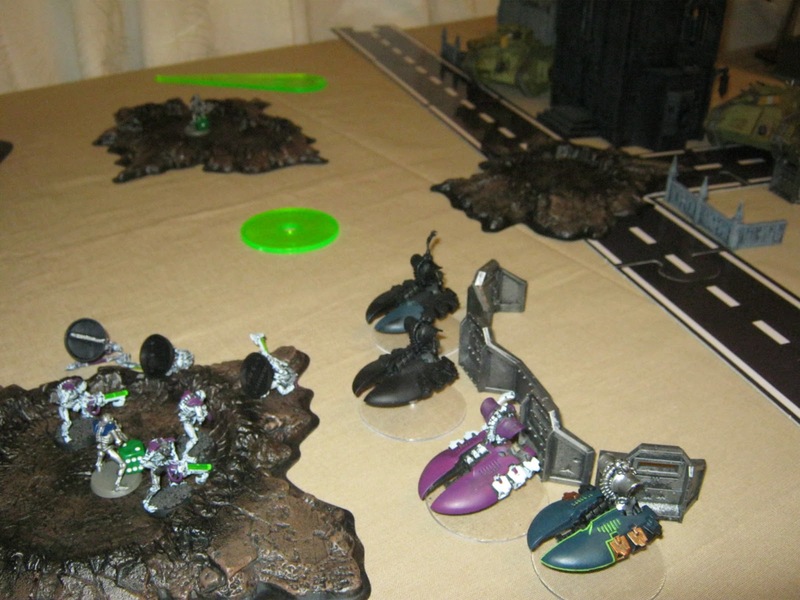 Because his assaults came in piecemeal I could defeat them one at a time and keep firing at his remaining troops.